Wash and dry pork chops really well. Salt and pepper on both sides. In a small bowl, combine maple syrup, stock and balsamic vinegar. Set aside. 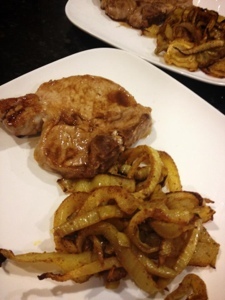 Add your pork chops to pan. Cook about 2 minutes and flip over to the other side. Cook another 2 minutes (more or less). Do not overcook. Remove to a plate and cover. Add your mixture of balsamic, maple syrup and stock. Deglaze pan and bring to a fast boil. Add pork back to pan for a few seconds.